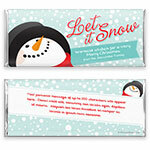 A sweet snowman spreads holiday cheer on this fun candy wrapper design. Design: Smiling snowman face against a backdrop of falling snow. Personalization: Front title and banner message, back message.